This is all the more extraordinary when you consider the time in which she lived. In the late 1800s, it was the Victorian era. At the turn of the century when she was a young teenager, things for women were pretty much the same – Victorian, prudish and conventional. Women were stifled and had very little rights. They couldn’t even vote. Georgia would make a major transformation from farm girl to artist. Georgia and her family lived in what could be called “hard scrap land.” It was Sun Prairie, Wisconsin, and she became attached to the farm, but mostly the barn so nature became a part of her being. It was her childhood and something that she knew and loved. It eventually had great influence on her art. She attended a one-room school in the Number Five district called the Town Hall School. All the children walked there together. Getting expelled from class and being sent outdoors as a consequence was a disgrace, so everyone behaved. They did their chores as children in a farm family do, but the highlights of their day were the books their mother, Ida, read to them as a ritual. They also listened to their mother play piano in the living room, and there were dominoes or checkers. But it was the history from books, the exploration stories like The Life of Hannibal, Stanley’s Adventures in Africa, The Last of the Mohicans, and The Adventures of Kit Carson that made them feel adventurous. That must be why Georgia never failed to relish traveling. In those days there was time for personal expression and her mother arranged for Georgia and her younger sisters Ida and Anita to have drawing lessons from the teacher who boarded with them. As part of their assignments they copied geometric shapes such as cubes, cylinders, and spheres from a drawing manual series by Louis Prang, which was popular at the time (and a long time after). At 12, she and her sisters went into town – a Saturday ritual – to study art. Their teacher had them study reproductions of famous art and copy it. Georgia got to use watercolor paints, a medium that would become one of her signature favorites. Once in the eighth grade a friend Lena once asked what she wanted to do when she grew up and when she blurted out, “I am going to be an artist." It surprised her as much as her friend. She didn’t really know what that meant at the time, but her mind was made up. Georgia never knew her grandfathers, who were absent because of their demise (life was hard and men died earlier), but her grandmother and her mother’s sisters were strong women. They were her models of vigor and independence. In the local newspaper were “social notes" about their visiting aunts, Ollie and Lola. They taught Georgia and her sisters that women could lead interesting lives. A strong example of this would be the local Lady’s Bucket Brigade, a group of active female citizens who won accommodations for their assistance in putting out town fires. At that time too, it was important that women be taught music and art because of their role in the sociological precedent, meaning, women were expected to provide decorations for life. To enhance home life with their knowledge and craft. Georgia was quite good at playing piano and had considerable skill with the violin – something that would provide aid and confidence in her later lifetime. Georgia and her brother Francis spent a year in Milwaukee attending a big public school and living with her aunt Lola. This was the first time spent out in the world. According to Roxanna Robinson, author of the book, Georgia O’Keeffe, a Life, their knowledge was drastically altered. “Georgia found herself in a loosely structured society, …adolescents here had more importance … and not in a good way—there were troublesome boys …who threw snowballs at persons in sleighs, made obscene comments to passing ladies, spat tobacco juice, smoked cigarettes, swore and read lurid dime novels." In addition, her family would move to Virginia because her father’s brothers had all died of tuberculosis and for him at least, it felt that his remaining in the cold, heartless climate of Sun Prairie would produce the same fate. As a young adult Georgia would attend an art school in Chicago and later the Art Students League in New York City under the guidance of William Merritt Chase, a reigning force among the loose constellation of painters called American Impressionists. Later on in life, Georgia would become quite the celebrity in New York City at gallery openings in her honor. She would also travel to escape the limelight by fleeing to Lake George in upstate New York, to Taos, New Mexico for the light and reflection, and the village of Alcalde in the Rio Grande Valley where she felt peace. A brilliant photographer, Alfred Stieglitz (1864-1946), devoted much of his efforts toward the acceptance of photography as an art form in America. He had already achieved this in Europe, having appeared in large invitational art exhibitions. Georgia was art posing for Eugene Speicher and the students wanted to go to “291" to see a Rodin showing of pencil and watercolor drawings. The idea took hold and on that snowy day, 20-year-old Georgia met Stieglitz on January 2, 1908, the day after his fortieth birthday. That would be the beginning of a life-long relationship and their eventual nuptials. Georgia’s first large solo exhibition in 1923 was held at the Anderson Galleries on Park Avenue at Fifty-ninth Street. The show ran from January 29 to February 10 and it was jammed. Some 500 people came each day. In the meantime, Stieglitz had another exhibition of his own work: portraits of Georgia and other subjects, pictures of Lake George, a body of work that was widely acclaimed. Nothing was ever the same after that for her notoriety since people wanted to know more about the photographer’s muse. Giant paintings of flowers were revolutionary at the time. 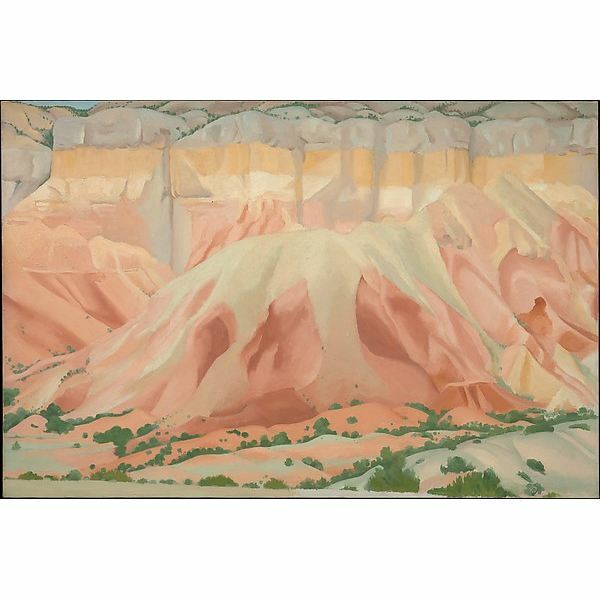 O’Keeffe painted images of the American Southwest because they made her happy, but viewers often felt sad because they were of skulls. Whereas, Georgia felt they were actually more alive, depicting the desert, the mountains, the flora and the colors, where she was just beginning to see color for the first time. “Nobody sees a flower, really, it is so small. We haven’t time – and to see takes time like to have a friend takes time." Georgia O’Keeffe followed no one. She continued to find her own way and was influenced by others, yes, but her timing and originality of featured subjects was widely recognized in the art world. She seemed ahead of the wave about what became wildly popular. During the late thirties and forties, O’Keeffe produced some of her greatest landscapes – painting at her peak, interpreting again and again the rapturous locations around her. Upon accepting an honor at Bryn Mawr College in 1971, O’Keeffe said, “Paint what’s in your head, what you are acquainted with. Even if you think it doesn’t count – and for some of you it may not – doing something that is entirely your own may be pretty exciting." Robinson, Roxana. Georgia O’Keeffe: A Life. Lebanon, NH: University Press of New England, 1989. Book. Rubin, Susan Goldman. Wideness and Wonder: The Life and Art of Georgia O’Keeffe. San Francisco: Chronicle Books LLC, 2010. Book.